I spent the night camped just outside Sunset Crater National Monument about 15mi NE of Flagstaff. I would have liked to do some hiking inside the monument but it seems the highpoint and the better cinder cones are off-limits. Boo. Instead, I planned to hike a loop outside the monument to the northwest, taking in O'Leary Peak with more than 1,500ft of prominence and a few other summits nearby, all of which can be found in Purcell's Rambles & Scrambles. There is a TH at the end of FS Road 545A where a very nice group campground is also located (I used it to refill my water jugs which were getting low). I had gotten up at 5a as had become usual this trip to avoid afternoon thuderstorms, but there was a light but steady rain falling. I went back to sleep on and off for the next two hours before finding the rain had finally stopped and I might have a window to get my hike in. There is a well-graded gravel/dirt road going to the lookout atop the lower east summit of O'Leary, but it is gated at the TH and serves as a 5mi one-way route for hikers. 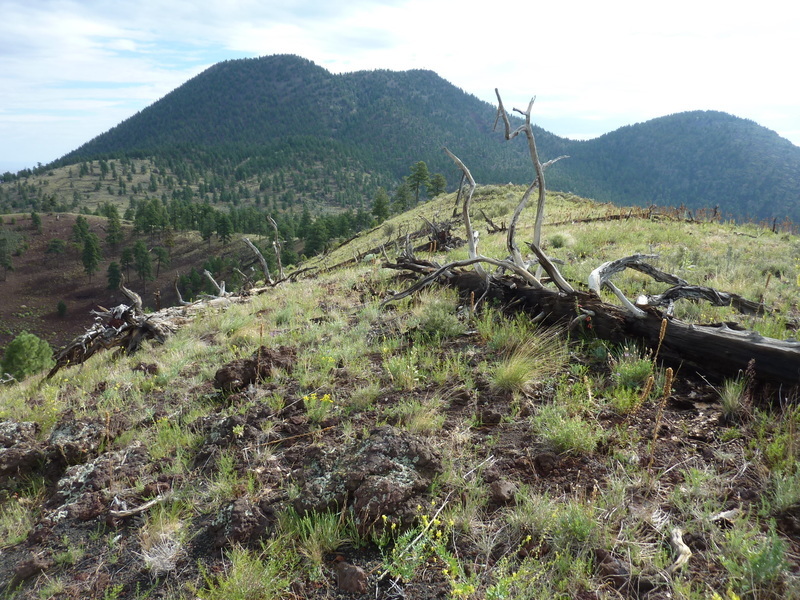 I had fully intended to take this route as others had on PB (and described in the guidebook), but upon finding the forest floor with clear and easy cross-country, I made a beeline north to Robinson Mtn, the first summit on my tour. At just over a mile from the TH, it would be about half the distance it would have been via the road. The climbing is steeper of course, gaining 900ft in only 0.6mi, but the rains had given the cinder slopes better cohesion and thus better footing. There was even a section of old road that goes to a cinder pit (marked as "Prospect" on the topo map) that made the lower slopes easier yet. I reached Robinson's open summit in 45min, finding fine views overlooking Bonito Park and the Bonito Lava Flow to the south, Mt Humphreys to the southwest and the much higher O'Leary summits to the north. I found no register here though Purcell had described finding one left by Barbara Lilley - too bad it had disappeared. I continued north over the summit and down a short distance to a saddle with O'Leary West. The first mile of the traverse between the two was very pleasant, high country stuff with easy walking and nice views. The last 1/3mi or so to the summit is terribly steep and the footing on the cinder slopes much poorer. It was the only part of the loop I didn't thoroughly enjoy. I reached the highpoint of the loop at O'Leary West just shy of the second hour. There is USFS benchmark and a register left by John Vitz in 2007. I thumbed quickly through the busy register, noting Adam Jantz had visited back in March. I haven't seen him in quite a few years, but glad to see he's still out peakbagging. 1/3mi to the east is the slightly lower east summit, atop which sits the USFS lookout tower. There is a use trail decending down to the saddle (a quick boot ski) where one picks up the good road which can be followed to the lookout. The tower was currently manned (or womanned?) by someone with New Jersey liscense plates on their Subaru parked outside. Signs at the bottom of the tower offered contradictory instructions: "Please No Visitors On Tower" and just behind it, "Limit Two Visitors in Tower at a Time." Well, phooey on that. It was 10a by this time, around the time one should be expecting visitors, but like the day before, I declined to go up to the tower. The natural highpoint is found in a rock outcrop just behind the tower to the east. From there one can boot ski much of the way down to the saddle with Darton Dome. Nicely, the climb up to Darton Dome is lower-angled than the descent off O'Leary East, which would make this the preferred way to do this loop, imo. Darton's summit was completely forested, so no views from this one. However, it had a register dating back to 1989, the oldest one I've seen yet in the Flagstaff area. A PB trip report had described the cinder slope descent off Darton as "excellent" and it didn't disappoint. For more than a thousand feet I bobbed and weaved through the trees and brush to maximize the amount of cinder gravel I could plunge step down. I eventually reconnected with the road/trail lower down and began following it for the last 1.5mi back to the TH. I quickly found it somewhat boring and decided to continue cross-country back to the TH, going up and over a low rise with more open forest understory. The outing came in at under 4hrs and just over six miles, probably about as short a route as one can make going over these four summits - a most excellent outing. "The high point and cinder cones are off limits"....??? That stops Bob Burd?? I'm shocked.